We are glad that you have found your way to our page that is dedicated to our commitment to Santa Monica, CA. 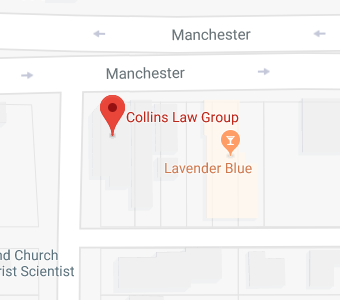 Here at the Collins Law Firm, we place an emphasis on community, and we do a great deal to make a positive impact on many different levels. There is no doubt that Santa Monica is one of the most desirable places to live in the entire country. It is historic, iconic, and truly unique. The Santa Monica Pier is a genuine national landmark. While locals love the Pier and the beach below, just about every American has a visit to Santa Monica on his or her bucket list. When you factor in the perfect weather, the vibrant diversity of the people, the dining, the shopping at Santa Monica Place, and the culture at the Santa Monica Museum of Art, you can see why the town has attracted so many high profile residents. As an estate planning firm that serves the Santa Monica area, we have helped countless local residents over the years. We have been practicing for a long time, and we have been fortunate enough to build long-term relationships with numerous Santa Monica families. If you are looking for an estate planning law firm that understands the needs of people in our area, you have landed in the right place. Estate planning is not a one-size-fits-all endeavor. There are different ways to go about it, and the strategy that is right for one family may not be appropriate for the next. Santa Monica is a very affluent city, and high net worth individuals have a certain set of concerns when it comes to estate planning. One of them is the potential imposition of the federal estate tax. There are adjustments to account for inflation on an annual basis, but if your estate is valued at over $5 million, you may well be exposed to the federal estate tax. This tax comes with a 40 percent maximum rate, so your legacy could be significantly impacted if your estate is going to be subject to taxation. When you are calculating the value of your estate for tax purposes, you have to include the value of your home. Real estate in Santa Monica is very expensive, so the value of your property alone can consume a great deal of your available estate tax exemption. If your estate is in taxable territory, there are steps that you can take to ease the burden on your family. Our firm can help you understand your options so that you can preserve a maximum store of resources for your family to draw from after you are gone. Clearly, everyone in Santa Monica is not going to be exposed to the estate tax. There is an estate planning approach that can be applied to virtually any type of situation, regardless of your financial status. The key is to work with an estate planning attorney who will provide you with personalized attention so that your estate plan can be custom crafted to suit your needs. Nursing home asset protection is an important piece of the estate planning puzzle. If you take no steps to brace yourself for these expenses in advance, nursing home costs could absorb the inheritances that you intended to leave to the people that you love. In the Santa Monica area, a year in a nursing home could cost well over $100,000, and many seniors require nursing home care for multiple years. The numbers can add up considerably if you have to pay out-of-pocket. Medicare will not pay for long-term care, but Medi-Cal will help you can qualify. If you work with our firm to develop a plan, you can potentially preserve assets for the benefit of your loved ones as you take steps that lead to Medi-Cal eligibility. When you plan your estate, you are taking a profound step, because you are preparing to leave final gifts to the people that you love the most. This is something that requires a great deal of attention, and you should leave no stone unturned when you are evaluating your options. We would be glad to help if you are ready to get started. We will make you feel comfortable with us from the start, and we will answer all of your questions and help you put the ideal estate plan in place. To set up a consultation, call us at (310) 677-9787 or send us a message through this page: Santa Monica, CA Estate Planning Attorneys.